You are currently browsing the category archive for the ‘Screencasts’ category. A screencast of this post here. 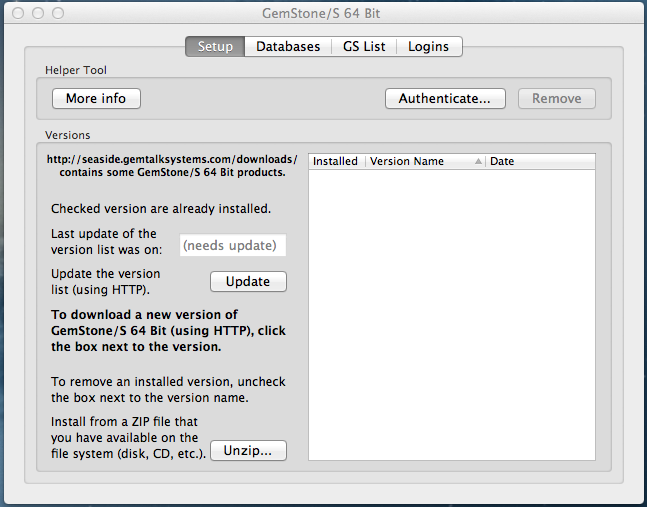 GemStone/S 64 Bit has been available for the Macintosh for several years but you generally need to install and configure it much like you would do if you were on a Linux/Unix system. That is, there are a lot of command-line steps and system configurations that are needed. For someone who is used to the Macintosh’s consistent graphical user interface and who is not so familiar with configuring a Unix server, this tends to create a high barrier-to-entry. 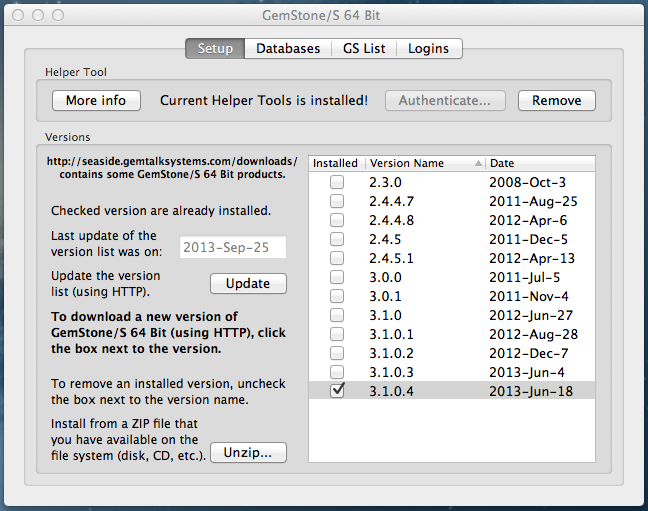 For a while I’ve been playing with an alternative that makes it easier to install and run GemStone/S 64 Bit on a Macintosh. This blog post will describe how to use this tool. 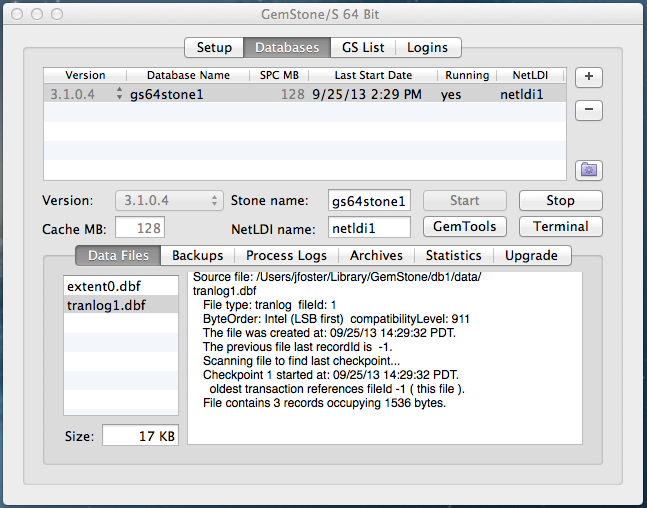 To start, download GemStoneApp.dmg, a disk image of a Cocoa application. Open the disk image to get to the virtual disk containing the application and a shortcut to your Applications folder. Copy the application to your local machine (typically, to the Applications folder, but it can be anywhere). At this point you can eject the virtual disk and delete the disk image. This will give you a 770 KB bundle that is a Cocoa application built with Xcode 5. You can launch the application in several ways. First, open Spotlight (Command + space) and type ‘gemstone’ (without the quotes). The application should be found and you can launch it by clicking on the name or just pressing Return. Second, you can use Launchpad, find the GemStone application, and then click on it. Finally, you can use the Finder to navigate to the folder holding the application (typically ‘/Applications/’) and launch it from there. If the system presents a dialog reporting that the application could not be launched because it was not downloaded from the Mac App Store then you have a couple options. First, you can configure your security to allow applications from “identified developers.” This is done by launching System Preferences, selecting Security & Privacy, unlocking the page if needed (click on the padlock icon at the bottom left if it is closed), and then click the radio button for ‘Mac App Store and identified developers’ under the heading ‘Allow applications downloaded from:’. Once this is done, relaunch the application (as described in the previous paragraph) and confirm that you want to run it. Second, you can use the Finder to navigate to the directory holding the application (typically ‘/Applications/’) and then right-click or Control-click on the application and select the ‘Open’ menu item. This may ask you to confirm that you want to open the application. If you confirm once then it will not ask again. Next you need to import the list of available versions by clicking the ‘Update’ button. When this finishes (it should only take a couple seconds), you will have a list of versions and their release dates. To install a version, click the checkbox next to the version name or (if you have already downloaded a zip file of the product tree from here or here), click on the ‘Unzip…’ button and select an existing zip file of a product tree. After the version is unzipped you can start to use it. Click on the Databases tab and click on the ‘+’ button to create a database. This will set up a directory structure, create a config file, and copy a base extent. You can change the version (if the database has not been used), edit the name of the stone, the NetLDI, and the shared page cache size. After you have made any changes you want, you can click the ‘Start’ button to start the stone (and related processes). In the Databases tab there are a series of sub-tabs, the first of which is ‘Data Files.’ Here you can select the extent(s) or tranlog(s) to see some information about them. The second sub-tab gives you some backup and restore options. When the database is not running you can initialize a base extent (a copy of $GEMSTONE/bin/extent0.dbf) or a ‘GLASS’ extent (a copy of $GEMSTONE/bin/extent0.seaside.dbf), and you can restore from a backup. When the database is running you can make a backup. The third sub-tab is ‘Process Logs’ and this gives you a list of log files associated with the GemStone processes. You can double-click a line (or select the line and click the ‘Open’ button), and the appropriate log file will open using the Macintosh Console application (used to view system logs). The fourth sub-tab is ‘Archives’ and gives you some information about archived process logs (the text files described above) and the transaction logs. These can typically be deleted without impacting a running system (though you might want to keep transaction logs made following any backup if you have to do a restore). The fifth sub-tab is ‘Statistics’ and shows a list of statmonitor files created while the system is running. If you double-click a line (or single-click and click the ‘Open’ button) then the application will launch ‘VSD’, a Visual Statistics Display tool that can be used to analyze the running system. After the Databases tab is a third tab, ‘GS List,’ that shows a list of the current processes. The port number for the NetLDI process might be useful. Returning to the Databases tab, we have the ability to open a Finder window on the database directory (the button with a folder). Here you can use the Finder to explore the implementation details of the database. There is a ‘GemTools’ button that opens a text field with a Smalltalk expression that can be pasted into a GemTools session definition. Finally, there is a ‘Terminal’ button that can be used to open the Macintosh Terminal application. This starts a new Terminal application (this will be confusing if you already have one running) with the current working directory set along with various environment variables, including $GEMSTONE and $PATH. From this terminal window you can execute GemStone commands like ‘gslist’ and ‘topaz’. Note that you can run multiple databases at one time and they can be different versions. When you are done you can click the ‘Stop’ button on the ‘Databases’ tab. When there are no databases running you can Quit the application (the application window can be minimized but not closed). Let me know if this is helpful and what further features you would like to see. Cloud Foundry is an Platform as a Service (PaaS) system that includes a number of popular languages and web frameworks. Because it is open it is possible to add other runtimes and frameworks. In this screencast we describe the process of preparing Smalltalk (AidaWeb on CogVM) to be deployed to the cloud and the changes made to Cloud Foundry to host Smalltalk. We follow the steps described here. Cloud Foundry comes with built-in support for a number of web frameworks and runtimes, but one of the features of being “open” is that we have access to the source code and can modify it to support new frameworks and runtimes. In this video (7:20) we follow the steps here to add support for Perl. We create a trivial Perl application and deploy it to our private cloud, demonstrating the extensibility of Cloud Foundry. UPDATE 2008-12-16: Mac OS 10.5.6 is out and http://support.apple.com/kb/HT3194 says that it “Includes fixes for possible graphics distortion issues with certain ATI graphics cards.” It does appear that thousands of colors now displays properly. UPDATE 2008-10-25: Working with the good folk at ScreenFlow, it does seem that the problem is pretty clearly with the Mac OS. If you switch to thousands of colors the title bar for other applications gets stripes in the title bar–even without ScreenFlow running. UPDATE 2008-10-05: Further investigation suggests that the problem occurs when the display colors is set to Thousands. The problem does not occur when the colors is set to Millions. According to Apple, the latest update to Leopard (10.5.5) “[i]ncludes extensive graphics enhancements.” Unfortunately, these “enhancements” do not play well with ScreenFlow. A couple days ago my MacBook Pro offered to install the latest OS X update that promised better security and stability. I’m generally a “bleeding-edge” sort of guy, so willingly take anything offered. It has taken me half the day to recover back to 10.5.4. At first I tried to use Time Machine to simply restore my System folder. This ended up corrupting things badly enough so the computer would not boot. I then did a full disk restore to the latest backup (which went quite smoothly). Then, I copied the /System directory out of the backup disk (using the Finder, not using the Time Machine user interface) to a temp folder. From there, I use the Terminal to move the current /System/Library to a backup, and move in the old one as the current one. When I rebooted, I was on 10.5.4 and ScreenFlow works fine. 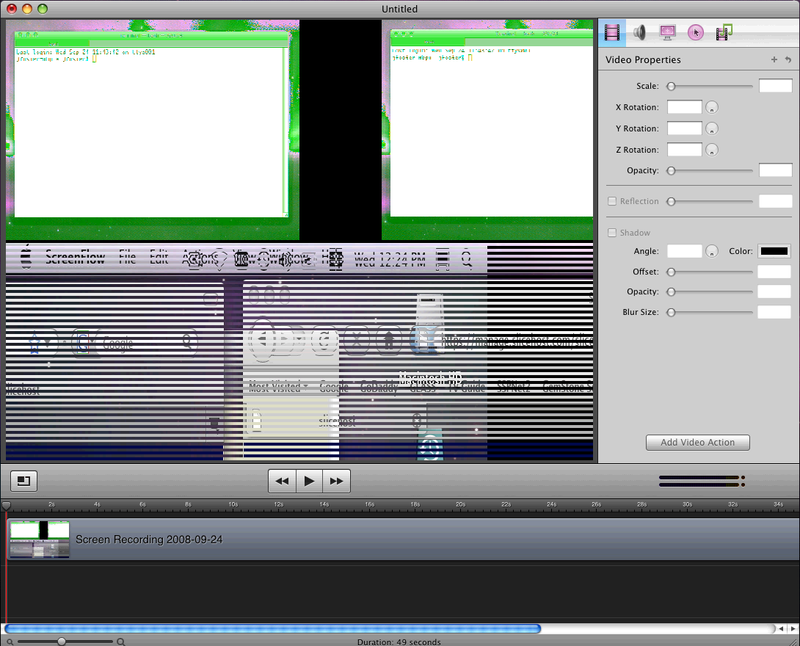 I’ve no idea of the cause of the problem, but I’ve put in a support request for ScreenFlow to address the problem. I’m glad to be back in business with ScreenFlow and hope I can upgrade to 10.5.5 soon! I’ve finished editing a video of the OTUG presentation last week. It is available on Vimeo or you can download the 288 MB file here. The slides are available as well. If you would like to have a similar presentation for your group, let us know!